Plants need water. You may like to take your vacation in the peak of summer, but being left alone for a week or two is hard on your garden. Your garden will fare better if you focused on drought tolerant plants and you've mulched and gotten your garden down to needing only 1 watering per week. Even so, hot temperatures, spotty showers, and unforeseen problems can set you up for disappointment when you come home. You can always pray for rain, but here are some more practical ideas for watering your plants while you are on vacation. If you have some to add, please share. If you are only going to be gone a week or less, you may be able to get away with a good soaking and a layer of mulch. Mulched plants lose 25% less water than unmulched plants. Of course, it all depends on the weather. Some plants may wilt or become stressed, but you probably won't lose any. If you already have a few inches of mulch on the garden bed, you probably don't need to add more. You don't want the mulch to be so deep that the crown of the plant is buried. In this case, just be sure that the soil beneath the mulch is wet several inches below the surface. Push your shovel through and check in several spots. If you want to add more mulch, you don't need to re-mulch the entire bed. Mulching around the plant roots will suffice. Drip irrigation may sound like an impossible task, but the process is quite simple and you can purchase inexpensive kits that basically pop together. Unfortunately, this is better done at the start of the growing season. It is more difficult to lay the hoses once plants are large and growing - but it's not impossible. 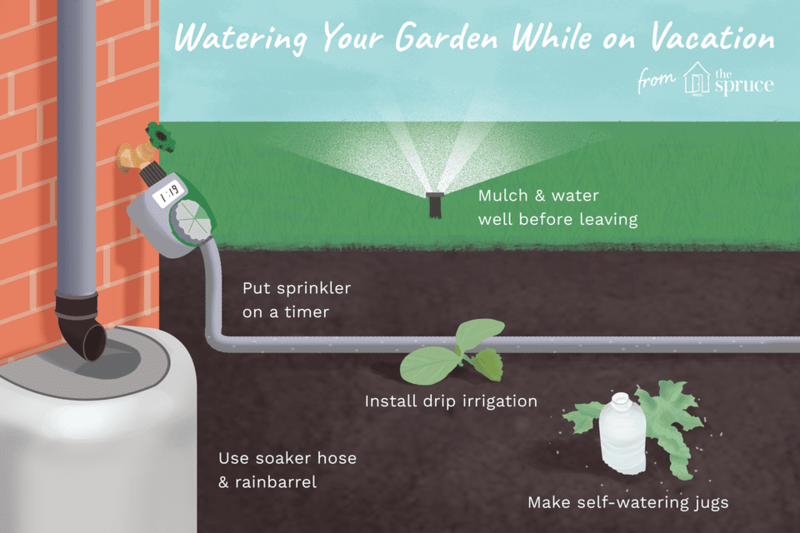 With drip irrigation, you can put a timer on your spigot and never have to think about when to water your garden. Higher end timers can even sense how much rain you've gotten and adjust accordingly. You don't need a drip irrigation system to benefit from using a timer. The timer option works just as well with a regular garden sprinkler. You may need a couple of sprinklers and connector hoses if your garden is spread out. 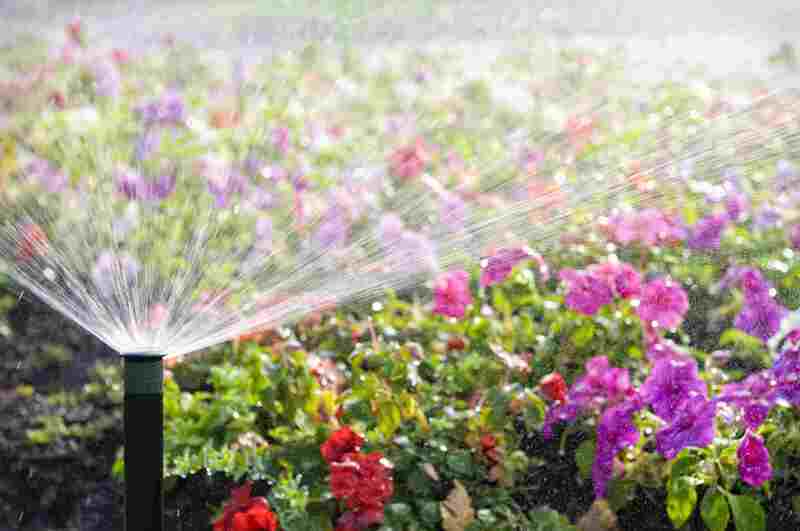 If you tend to change the layout of your garden from year to year, sprinklers and soaker hoses can be a better option, because they are easier to move around than a drip irrigation system would be. Drip irrigation is designed to target each individual plant, but sprinklers and soaker hoses will water wide areas. Rain barrels are great ways to catch and store "free" water. If you have a rain barrel, attach a soaker hose to it and run it through your garden. It will leech out slowly and saturate the ground. Water well, before you leave, and the ground will soak up that much more. Don't worry if it hasn't been raining enough to fill up your barrel. You are allowed to cheat and fill it with a hose, for times like this. If your rain barrel holds standing water for any length of time, be sure you use some sort of mosquito control, or you'll be solving one problem by inviting another. Some gardeners have had luck making their own self-watering jugs. Just take some old, plastic beverage jugs and bottles and poke the tiniest pinholes in the lower side of the jug. Place the jug in the soil next to your plant, a couple of inches below the soil surface. Water the garden well, then fill the jug with water, just before you leave, and it will slowly drip additional water to the roots. Obviously, you will need several jugs, to water an entire garden, but you can put one jug in between four plants and concentrate on the plants that need constant moisture. You can also use this method for containers. A lot of gardens have several plants in containers, usually scattered about the yard. These containers require even more water than the plants in the garden beds. To make sure they get some water, move your containers into or near your garden, where they will get water from the sprinklers. To cut down on the amount of water they will need, move the containers into a shady area and cluster them together. The will lose less moisture to evaporation in shade and grouping them together will allow them to create their own humidity. This will help prevent wilting during the day. Sometimes you can't move your containers or perhaps you have a container that needs a lot of supplemental water. Water bulbs or globes and other self-watering gadgets are a good supplement. Be sure to water the container thoroughly, shortly before you leave, and then fill and insert the bulb. The water will slowly drip into the pot and can usually buy you about a week's time before the plant needs more water. Another option for containers is to add some water holding material to the soil or even next to garden plants. Buried sponges, newspaper strips, even pieces of (clean) diapers will soak up excess water and slowly release it back into the soil. Bury or place the material and water everything well. Form a vacation watering co-op with one or more friends. Make arrangements to take care of each others garden while away on vacation. You'll care for their plants while they're away and they'll care for yours, while you take off. Try and make it easier on them by keeping the hose handy and ready to go and grouping as many plants together as you can. If you are going to be away 2 weeks or longer and your garden will be unattended, your best option would be to hire someone to come in once or twice a week and either use the hose or turn the sprinkler on and off, and maybe even mow. Check with a garden designer or maintenance group. They may not do one-time care, but they will probably be able to refer you to someone who will. Hopefully, you have already chosen plants that can withstand a short period of drought. Drought tolerant, or xeric plants, can pretty much take care of themselves, once they are established. Of course, we all grow a prima dona or two, but it's much easier to care for a handful of plants than a whole garden. If you haven't incorporated the concept of xeriscaping or water-wise gardening, it is well worth looking into. You'll be surprised how many plants are considered somewhat self-sufficient, whether facing drought or a rainy season. Do a pest check the week before you leave, to make sure you treat the problem(s) and it doesn't balloon while you're away. Don't just spray indiscriminately, but if you do see a fungus setting in, an animal munching, an infestation of aphids, take action before leaving your garden unattended for a week or more. It doesn't take long for a small problem to become a large problem. If it's an animal problem, you can spray deterrent, add temporary fencing, put up an action detector or just some shiny dangling CDs or noise-makers to help to confuse the animals like groundhogs and rabbits. Protect large portions of your garden by hanging shade cloth to diffuse the light. Shade cloth is often used in greenhouses in the spring, to prevent tender plants from burning. It can also be used to protect gardens in the heat of summer. You can stretch it across a fence or hang it from two poles, where needed. For temporary use during a vacation, you can always use old sheets, sheer curtains or old screens. A permanent version would be a lathe house. Be prepared to lose a few annuals and unestablished perennials. If it's very hot and dry and if you are going to be gone a week or longer, it's inevitable, but it's not the end of the world. When you get back and start watering and tending your garden regularly, things will perk back up. On the plus side, lack of water and high heat will also slow down the weeds. Let your friends know it's okay to come by and harvest vegetables, so they'll keep producing and won't attract animals. Unfortunately, you can't stop the ripening process. Ripe tomatoes will simply fall off the plant and ferment. If others are enjoying the fruits of your garden, they'll be more likely to help you take care of it. If you have indoor plants that will be fending for themselves while you are away, keep the blinds partially closed, while you're away. This will keep the room cooler and the plants will lose less moisture. You should also cluster your plants together, away from direct sunlight. The evaporation from their leaves will keep the air humid. Soak the soil in each pot completely before leaving, so they stay hydrated. Use capillary motion. Make a wick with a cotton string, shoestring, or yarn. Thoroughly water your plant. Shove one end of the string into the soil, about 1--inch deep. Firm the soil around the string. Put the other end in a bottle or jar of water, slightly higher than the plant container. The water will wick from the container of water, into the soil. A soda bottle 16 or 32 oz. size should keep the soil moist for at least a week, maybe longer, depending on the size of the pot and the thickness of the string. Keep in mind that the string can drip, on its way into the container. Don't set this up on a good piece of furniture or near an appliance cord. If this seems too complicated, you can always use the watering globes, mentioned above. What Are Common Plants That Are Surprisingly Poisonous?